It’s been a week of painting for the most part. As I think I’ve said before, I’ve been invited to hold an exhibition of my work at ‘the gallery on the corner’ in Edinburgh during March. The exhibition preview is on Friday March 1st and the show will run until the end of the month. I’m looking at providing around 17 pieces of work for the exhibition including a good selection of the smaller acrylic & pastel paintings. After three months of quite good sales in the lead up to Christmas, it’s meant that I’m a little short of the smaller paintings now and I’ve been working on some new pieces recently. I’ve completed four 30 x 30 cm paintings and have several more on the go. I’m also working on a couple new 76 x 23 cm paintings too. All of these are based on our most recent walks, to Rannoch Moor, The Ochil’s and I’m hoping, from the walk we did in Cononish Glen yesterday. On each of these walks we’ve had superb conditions creating beautiful colours, patterns and contrasts. Each day was different but very atmospheric in its own right. The latest small piece to be completed is based on the view we had looking across from the Ghlas Beinn ridge towards Achaladair a few weeks ago. 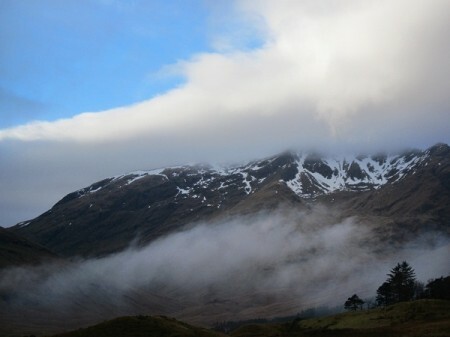 Needless to say, it was cold and as we wandered along the broad grassy ridge a line of low cloud crept along the glen below us. This painting is my current ‘Work of the week’, ….just click on the ‘Home’ link to see it. 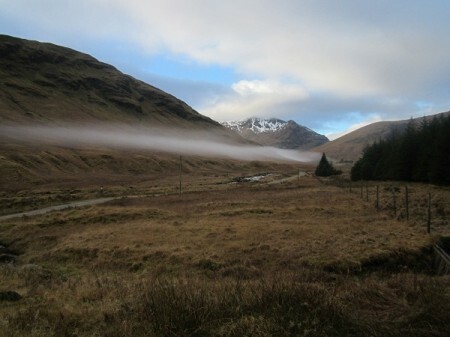 Our walk yesterday had similar conditions, except that we were down in the base of the glen, (Cononish Glen) and the banks of cloud and mist were drifting along at different levels, some at ground level, some higher, skirting around the hillsides like a tide-line. It made for strange and interesting scenes. I had actually planned this easy walk for quite a time, hoping to see the main big corrie on Ben Lui close up and under snow. But of course, the best made plans and all that! Instead of snow covered mountains as I’d hoped for in early January, we found almost no snow. The exceptionally mild conditions since New Years Day had meant a rapid and almost complete thaw, leaving just a few obstinate patches high up on most of the bigger hills and none whatsoever on the smaller ones. 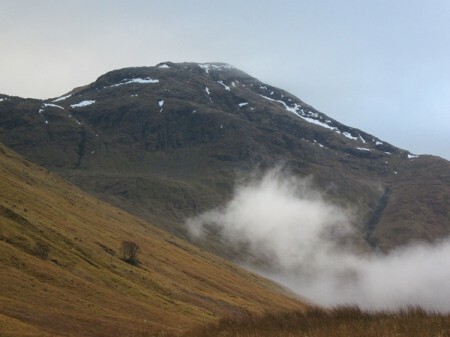 This said however, Ben Lui is one of the bigger mountains and rises to around 1100 m and its huge and magnificent corrie does face east …or north east ..I’ll have to check the map! But whatever the exact direction, it does mean that the corrie and the big gullies leading up from it, do tend to hold on to their snow a good deal longer than elsewhere. This was the case yesterday and although there wasn’t much snow, the big gullies leading up from the corrie into cloud and towards the summit, were still full and created a marvellous pattern against the dark rock of the upper mountain. Our walk yesterday was really just one for looking, taking a few photos and trying to come up with ideas for new work. 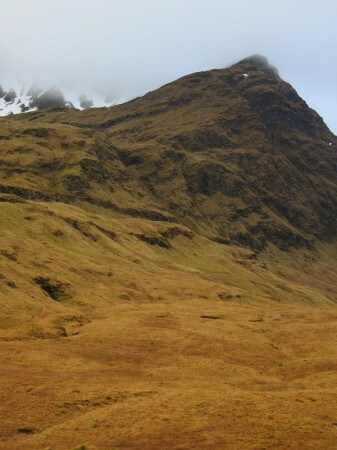 It normally takes us just under two hours to walk from Tyndrum up Cononish Glen to the end of the estate track directly below the bulk of Ben Lui …the point where normally we’d ford the stream and start heading up. Yesterday though, we took nearer three hours! There was no rush and we could just wander along taking in the wonderful changing scene before us as the banks of mist and cloud came and went, sometimes dark and threatening, at other times, light, wispy and translucent as it moved across the hillside caught in a brief shaft of sunlight. Strangely, although I was hoping to get ideas for new paintings, I actually came away with ideas for some new graphite drawings! Not quite what was planned, but if there’s one thing I’ve learnt over the years, it’s that you have to be flexible! After a great little walk, now all I have to do, is the work.